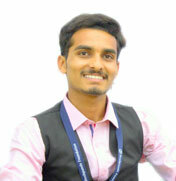 Mr. Rakesh Ramesh Totakar holds a Graduate degree in Mechanical Design Engineering from Gogte Institute of Technology, Belagavi. He joined LEAD Program as a Leader in 2013 while pursuing his higher education. On being inspired by LEAD, he dedicatedly participated in every function conducted by LEAD. He participated in LEAD Leadership Program camp in 2015. He was also a part of design thinking boot conducted by hubballi Sandbox as an innovator. Rakesh attended "LEAD PRAYANA 2k16". As a LEAD Intern, he mentored more than 1000 leaders to come up with innovative projects. He loves working with creative young students which lead him to continue his journey in LEAD as a Program Associate.